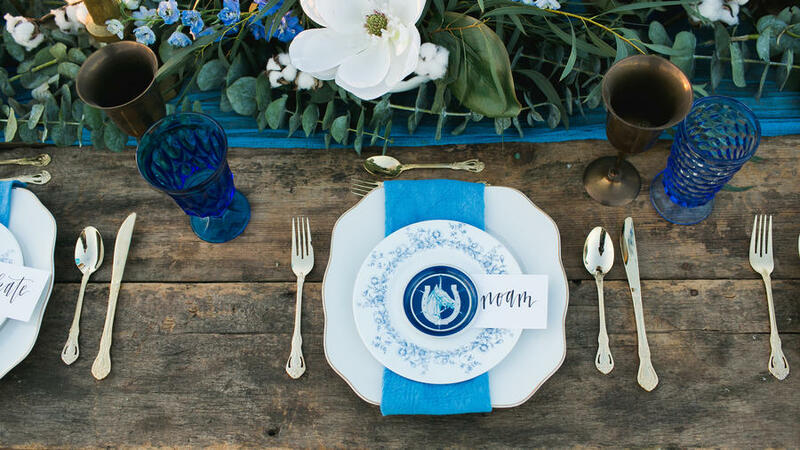 It’s a phrase that we all hear at every wedding, but incorporating the color blue doesn't have to be an afterthought based on an old wives’ tale,” says Amy Kolodziej of . 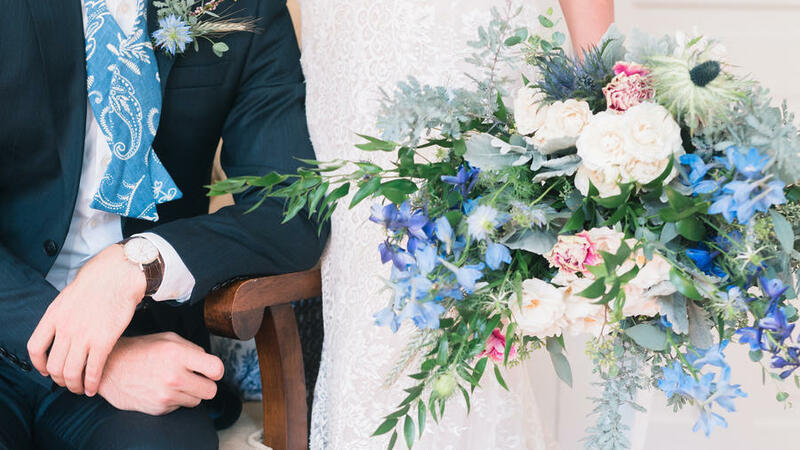 Your S.O.’s outfit as well as your bouquet are just two of the ways to add in a cool touch of blue. “A nice soft blue can pair well with both neutral tones and a bolder shade of blue in floral or table décor,” she adds. It all ties in together beautifully for a natural, yet elegant look. Stationery is highly personal and should always set the tone for your wedding as guests are receiving their first taste of what's to come. 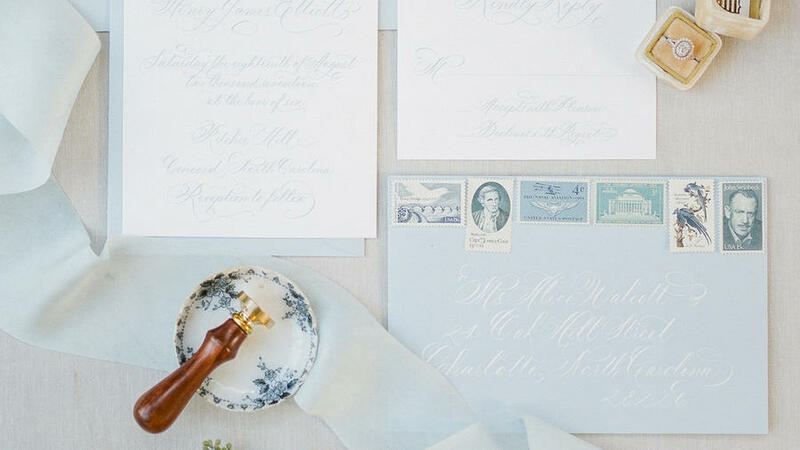 Here, the use of classic calligraphy oozes a vintage vibe while the soft blue color hints at an oceanside venue. 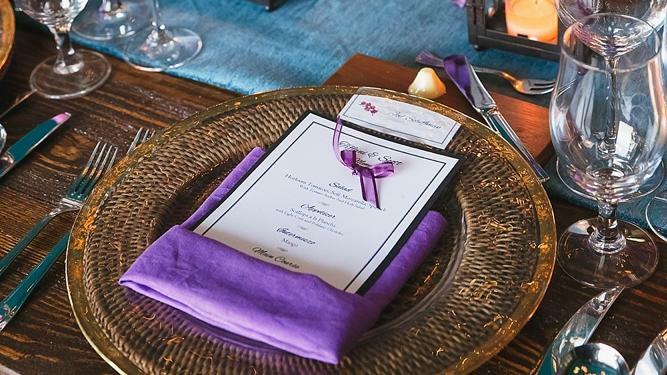 “With purple being a featured color on this tablescape, it can be hard for the blue to stand out. But this soft and beachy tone makes a perfect runner complementing each element on the table—from the purple blooms to the gold chargers and black metal lanterns,” says Megan Velez of . 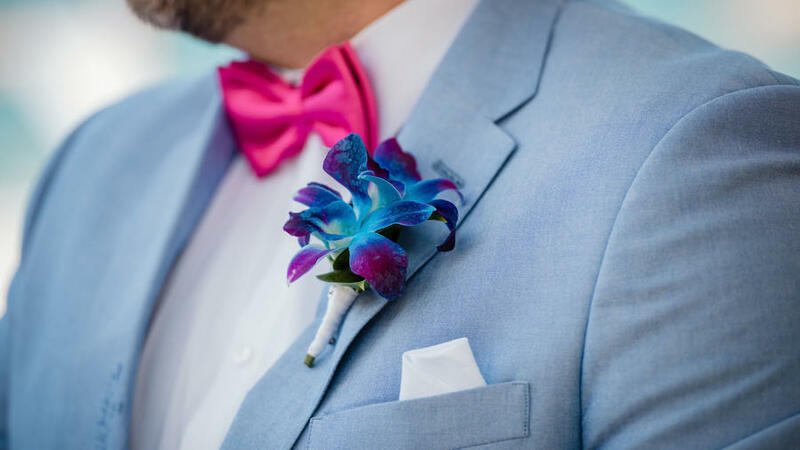 “This boutonniere is the epitome of a fun beach wedding,” Velez adds. The bright shade of blue accentuates the deep purple of the flower, and is perfect for a summer celebration. 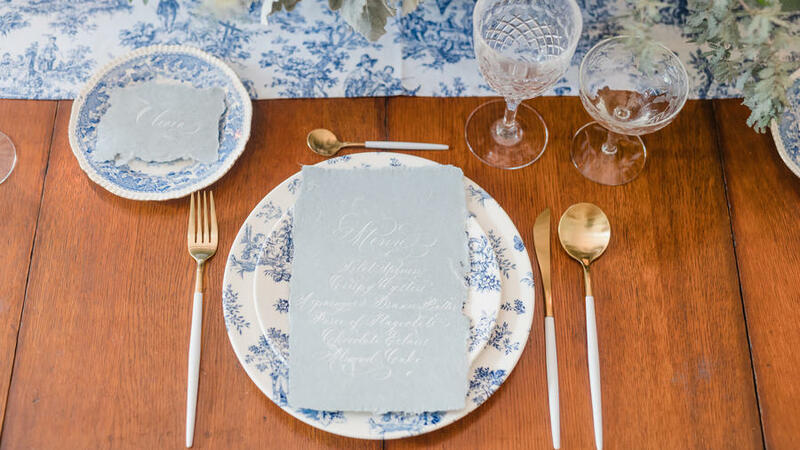 “We love seeing a pops of blues to accent a reception table — the color is much more impactful when used sparingly,” says Morgan Montgomery of . 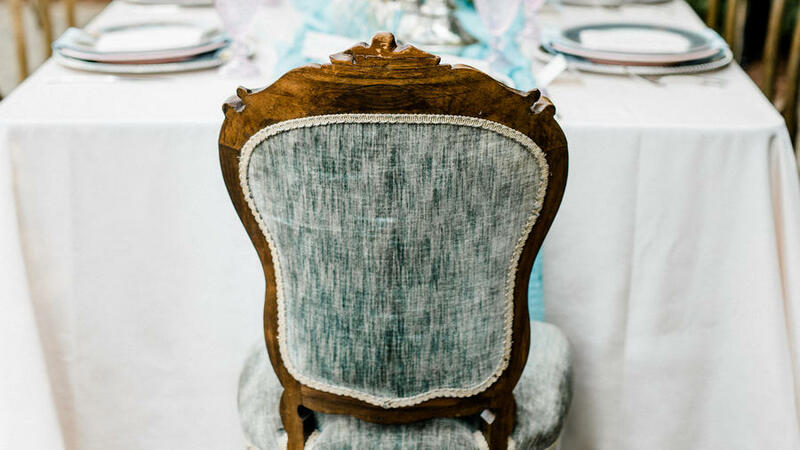 She suggests using shades of blue only for certain décor elements such as the candles, a runner, and, maybe, the chairs of the bride and the groom. Less is more, after all. “Consider adding a dash of surprise with unexpected elements [to your wedding], such as your getaway car. 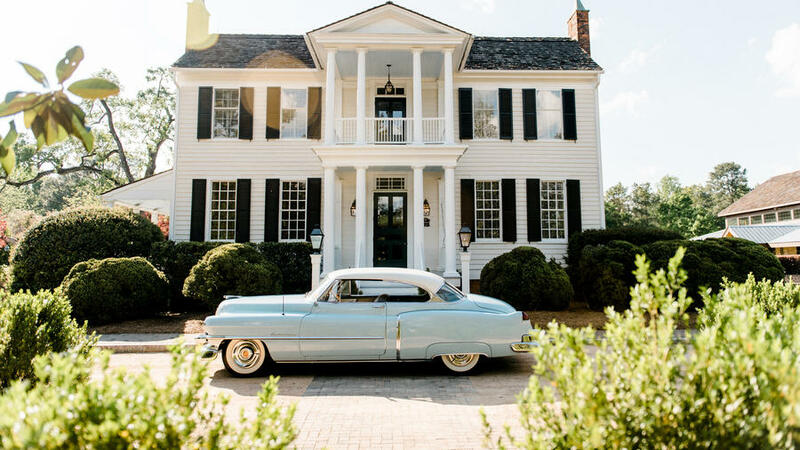 Vintage automobiles are becoming more and more available and it can serve as that final, lasting detail to pay homage to your wedding day palette,” says Kylie Carlson of . Agate and geode décor elements have become wildly popular in the world of weddings. 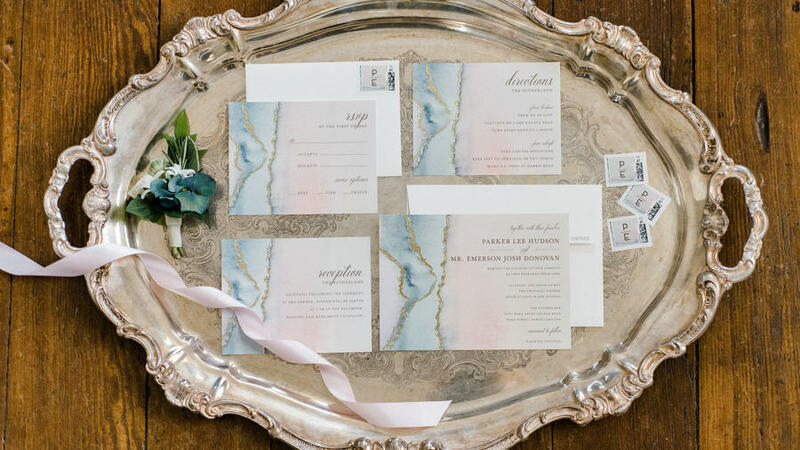 “This agate-inspired stationery from Minted does the perfect job of introducing the blue hue in a modern way,” adds Carlson. 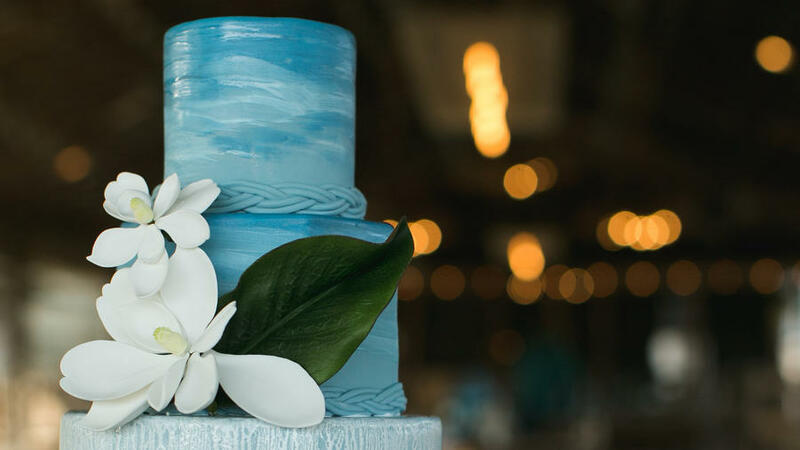 “Don’t be afraid of adding color to unexpected places throughout the reception decor, such as the wedding cake. Opt for a simplistic design to keep it feeling classy. Adding a girly touch such as magnolias to a bold blue keeps it feminine,” suggests Brandi Hines of . “Avoid making the guests’ place settings too matchy-matchy by mixing tones of the same color and mixing metals with wood. A bold floral centerpiece with contrasting colors grounds the table,” she adds.